As a tugboat driver on the Columbia River in Washington, my grandfather had a seemingly endless supply of rugged, plaid, wool Pendleton work shirts. The signature button down has been making its way into everyday men's fashion for years—my husband has a healthy collection of his own. And the venerable 150-year-old brand also boasts an extensive line of beautiful women’s clothing. Pendleton pieces make a statement whether you’re out and about on a brisk evening in the city or roasting marshmallows by the campfire. 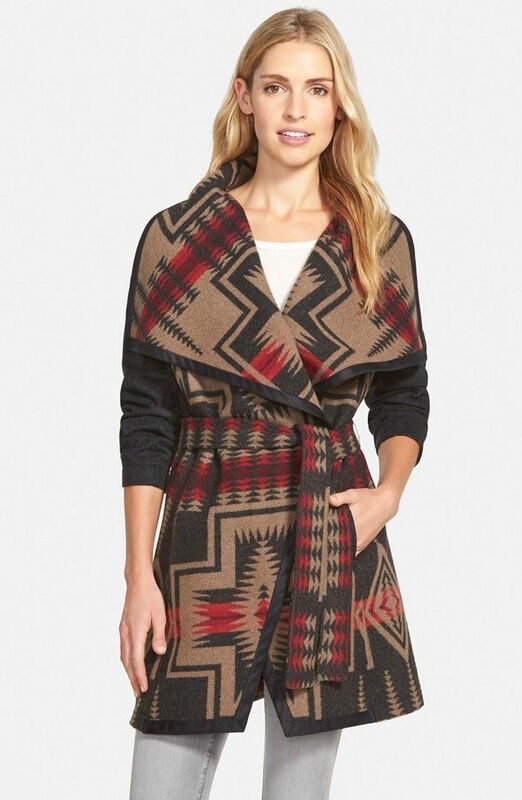 I’m a fan of the gorgeous Signature Blanket Wrap Coat in the “Harding” print, one of the Native American-inspired patterns that the company is well-known for. One of the many gorgeous pieces that I favor is the ultra soft Woven Jacquard Scarf in subtle camel and gray plaid (found locally at Stripe). If you’re heading into the wilderness, bring along a striped blanket such as the Pendleton Camp Throw (also featured in our Fall Fashion photo shoot). Incorporating a piece of Pendleton wool into your wardrobe is the perfect way to welcome the fall and winter fashion seasons.